Two Long Sea Bass Trips: Wednesday, Dec 3rd - $125.00 - 6AM to 3:30PM. Longer Still On Thursday, Dec 4th - $150.00 - 5:30 AM to 4:30PM - Looks Like A "Calm Before The Storm" coming..
All Winter Trips Announced Via Email Only. Times, Prices & Species Will Vary. If You Suffer Mal-de-Mer In A Car You Should Experiment On Shorter Half-Day Trips First! 10,716 Reef Blocks by the rail – 3,000 at Jimmy Jackson's – 2,136 at Doug Ake's – 1,182 at Saint Ann's – 558 at Eagle Scout Reef - 557 at Lindsey's Isle of Wight Reef and, just begun, 118 at the Brian Sauerzopf Memorial Reef..
Weatherman was right about last Saturday's calm. Seas were very kind going offshore. When afternoon's wind came early, however, I gave up on getting a boat-limit of sea bass in favor of just getting home. Lots of limits aboard, just didn't seal the deal. One guy had nine fat keepers in a row on a jig. A very skilled youngster even caught an 8.5 pound fluke on a hammered gold spoon.. While taking a beating on the way in Saturday, I just knew Sunday's continued sou-westerlies would be even worse - so I cancelled the next day's trip. Naturally there was virtually no wind at all Sunday..
Fisherman's Lament: "You'll go broke if you listen to the weather; die if you don't." Derned if weather forecasting isn't a lot better than ever before though. They say there's a calm coming mid-week and I'm buying it.. Those two trips are announced above. For now the December fishery I'd always envisioned; a fishery I have, literally, tried to build from nothing, a fishery tucked up under the beach for tautog that never existed before; that fishery remains lost to Maryland ... because MuRFSS showed shore anglers catching 81,000 pounds of tautog in Nov/Dec 2000 & 2001 from jetties that certainly aren't 'natural habitat' either. In 2004, management, acting as they always do, ignored the fact that 2000 & 2001's estimates were 37,000 pounds higher than all the years between 1981 & 1999 combined and made decisive new regulations to curtail "obvious overfishing.."
So, although virtually all of the shore catch's spike was shown in November; December was closed to satisfy NOAA's computers. We carry the weight of fisheries restoration on our backs in ever-increasing regulation while other tools; other necessary measures--even superior methods of restoration--lie unused in managers' toolkit. While many fisheries around the world are being restored, at least in part, with a habitat philosophy; in the Mid-Atlantic no reef is recognized as fish habitat. No natural reef is even recognized to exist! Management: "Thanks for building those reefs where tautog are obviously flourishing. Yup, we cannot point to a single remaining natural reef where natural populations have been restored via regulation & we certainly have no idea if assertions of corals in nearshore Mid-Atlantic waters are true. Say, we need to close a bunch of season to make our computers look good to Congress. You don't mind, do you? Catch Estimates Don't Lie You Know!" Hey Management: Happy Thanksgiving to you too. Capturing reef habitat's importance to reef-fish restoration would accelerate US fisheries' success while creating fantastic new levels of fisheries production. Management has, thus far, seen no value in investigating reef loss that occurred from the beginning of industrial fishing into it's height. Management continues to see no value in artificial reef building whether as a creation of new production or restoration of lost production. On the water we see explosions of reef-life whenever a calamity happens such as with the shipwrecks Bow Mariner or Marine Electric. Historically, however, we've seen collapse of reef populations when calamities of gear impact occur. When growths are trawled or dredged off rocky bottoms, fishery production declines to almost nothing until regrown. Indeed, where horrors of war were visited upon the East Coast's shipping in 1941 & early 42; where the tragic loss of ships & men in storms at sea occurred - Those Ships Lost To Torpedo & Storm Were Where We Caught Fish During Seafloor Habitat's Ecological Bottom. When trawling & hydraulic clamming had destroyed all the habitat they could by the mid-1970s, wrecks were all that was left. When newly discovered; fishing on those wrecks was wonderful. LORAN C allowed repeat & pinpoint navigation to these far-smaller reefs. Much more productive than low-profile natural reef, wrecks can hold incredible populations. Only after they too were fished-down did the sad truth of overfishing, the real devastation of entire reef fisheries, come to be seen. Lots of people at the top of management have spent their career not liking artificial reef. The tire fiasco & widely held belief, 'Artificial reef only attracts fish for easier recreational removal' is deeply ingrained. Improvements we fishers see plainly are hard to envision through a computer screen. We've learned from mistakes; artificial reef can easily be engineered with environmentally benign material (rock & concrete - even steel) and soon becomes a source of habitat-based fishery production. I'm trying to help management get the message..
Catch restriction was & remains a prudent restoration strategy. I believe populations will climb far beyond "restoration" targets when fish are managed for maximized spawning production and habitat improvements are fashioned in grand scale. In the MAB we must first recognize seafloor habitat even exists before it can be employed as a restoration tool. What a sad state our region's fishery science is in..
Scientists will tell you, "Exponential population growth is unsustainable." And it is.. Every experiment shows that; every real-life example too. But Why? Because exponential population growth swiftly exceeds an environment's ability to provide sustaining resources. Once exhausted, the previously increasing population declines rapidly. That's why farmers harvest their crop instead of letting it go to seed again & again. A field would exhaust it's nutrients and offer no profit whatever were it left unharvested. A farmer must utilize his resources wisely. Once best planting strategies are devised, any further increase in harvest could only stem from increased "planting habitat" - from more acreage being tilled. It's vital we get NOAA to understand the value of forced early spawning in conjunction with habitat fidelity. Rolling rocks off a barge, even tossing a few cement blocks overboard every fishing trip increases "tillable" acreage. Forced spawning provides incredible new levels of seed. Exponential population growth is precisely what a harvester wants to create. So far, NOAA only wants to restrict.. Were NOAA to re-create the circumstances of exponential sea bass population growth seen for about 5 years during early management, and if NOAA recognized it would be better to catch those fish both commercially & recreationally rather than allow them to collapse via overextended available resources; We would swiftly see elevating fish populations and loosening regulation. 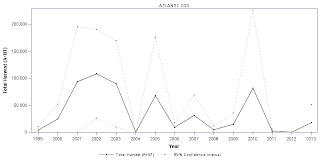 Below you'll see catch estimates from several party boat species along the East Coast & Gulf. In late 2003 repairs were made to the For-Hire estimates (Party/Charter). Given that For-Hire fishers must surrender catch information on a daily basis, one would hope for some measure of increased accuracy. You can plainly see increased regulation's effect on each region's For-Hire fishery. Soon after 2003's For-Hire repair, Private Boat estimates began to skyrocket ..while marinas still wonder where slip renters & fuel buyers have gone. Describing Private Boat estimates accurately would require not very pleasant verbiage on Thanksgiving Day. Below I'll offer actual examples instead. While professional catch falls headlong into regulation's abyss, private boats set new highs.. The dark line in each graph represents actual catch estimates used by management when creating new regulation. The grey dotted lines represent PSE (percentage standard error) which, for we non-statisticians, is similar to "Margin of Error" in a political poll -- it's just vastly larger than anyone would ever accept. Statisticians consider the entire spread to be their answer to "How Many Fish Were Caught" - Managers "ain't got time for that" & only use the centerpoint. Because assertions of recreational over-harvest are wildly untrue, the For-Hire industry is being robbed of Cod, Haddock, Black Sea Bass, Red Grouper & especially Red Snapper. US fisheries policy squanders valuable time & an ocean of potential so long as science & management remain blinded by catch-estimates. Once real science is brought to the fight we will quickly make reef-fish populations greater than ever before.